On July 26, 1990, the Americans with Disabilities Act (ADA) was signed into law. Iowa’s former senator, Tom Harkin, wrote the bill and Iowa City has held a celebration every year since then. 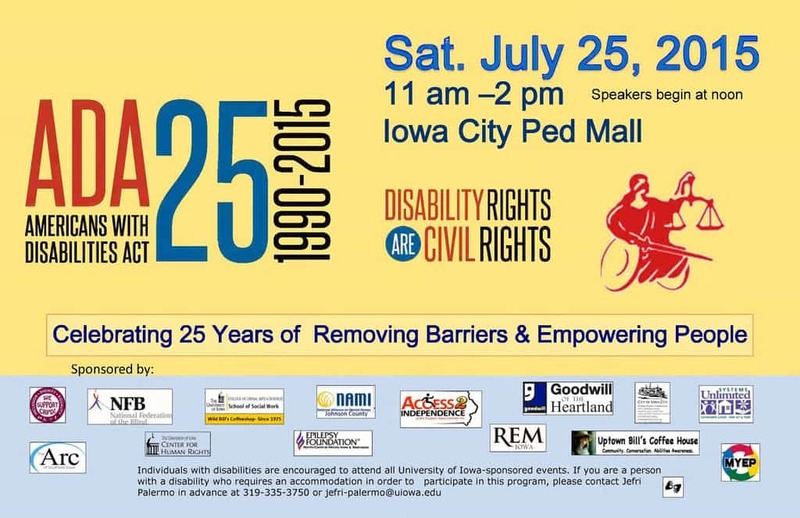 The University of Iowa Council on Disability Awareness has planned a number of events to celebrate the 25th Anniversary of the signing of the ADA into law. 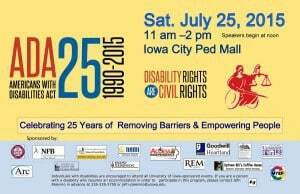 This year’s celebration is scheduled to take place on the Pedestrian Mall, Saturday, July 25th from 11:00 a.m. to 2:00 p.m.
Tara Fall, an Iowa native who now lives in California, is the keynote speaker and will speak at 1:30 p.m. She had a stroke while undergoing surgery for seizures when she was 27 years old. She now has prosopagnosia – “face-blindness.” She is the author of “Brainstorming: Functional Lessons from a Dysfunctional Brain.” Saturday’s festivities will also include music, dance, and booths. Mobility disabilities often cause the person to look passive and dependent which reduces their opportunities for constructive engagement. ADA mobility requirements include ramps, accessible parking, and drinking fountains. But, it also has requirements for such varied public places as amusement parks, golf courses, children’s play areas, fishing piers and more. Assistive Technologies (AT) are continually being developed and refined for a wide-range of mobility needs and include wheelchairs, hearing aids, prosthesis and Voice Output Communication Aid (VOCA). When using AT a person with mobility impairments is better able to interact with the environment and the people around them, thus making them less dependent on others. Physical limitations often includes the need for computer adjustments. For those with difficulties managing a mouse there are joysticks and trackballs. Eye trackers can also take the place of a computer mouse, and keyboards can be enlarged or color-coded. Websites can be difficult to navigate for many differing disabilities. Text-to-Speech can help those with visual impairments. Those with auditory challenges are unable to listen to audio-only recordings, or audio-visual recordings with no closed captioning or transcript available. 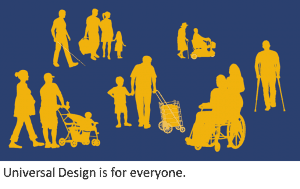 The Web Accessibility Initiative has resources for people with disabilities, and those making and implementing policies. Universal Design (UD) is the process of making things safer, easier and more convenient for everyone. UD addresses the wide spectrum of human abilities and designs for that diversity, thus making things easier for everyone. For instance, installing the ramps on the corners of sidewalks for people in wheelchairs has also benefited people pushing strollers. For a fascinating look at how UD is making life easier, we have Universal design: solutions for a barrier-free living. There is a wide-range of abilities and needs for those with Autism Spectrum Disorders (ASD). Video games using storytelling have been shown to help teach social skills to those with ASD. Video games have also been used in cognitive therapy for brain injury, physical therapy, and pain management. For more information on the use of video games with ASD check out Assistive technology research, practice, and theory, and for work with brain injuries refer to Assistive technologies and computer access for motor disabilities. 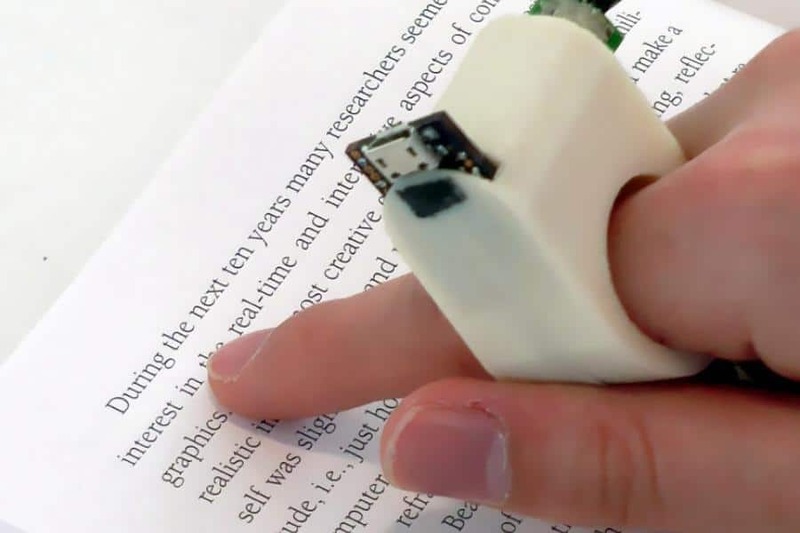 FingerReader, wearable interface for reading on-the-go. MIT Media Lab. Assistive Technologies are also used for reading text. The Yale Center for Dyslexia & Creativity has information on which popular tablets are best for people with dyslexia. For those needing help accessing printed text there are devices such as the FingerReader. For more information on human/computer interaction, inclusive design for communities, transportation and everyday objects, stop in and check out our many resources! Subject Guide: ADA and Universal Design. July 13, 2015. University of Iowa Lichtenberger Engineering Library. Rhoads, Marcela Abadi. The ADA companion guide : understanding the Americans with Disabilities Act Accessibility Guidlines (ADAAG). 2010. Hoboken, NF : John Wiley. Engineering Library KF5709.3 H35 R48 2010. Assistive technologies and computer access for motor disabilities. 2014. Hershey, PA : Medical Information Science Reference. Engineering Library HV1569.5 .A87 2014. 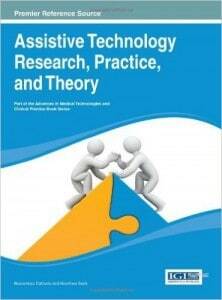 Assistive technology research, practice, and theory. 2014. Hershey, PA : Medical Information Science Reference. Engineering Library HV1569.5 .A85 2014. How people with disabilities use the web: overview. Aug. 1, 2012. W3C, Web Accessibility Initiative. Assistive technology: a Q&A with Roy Shilkrot about the FingerReader. Sept. 3, 2014. Belo Miguel Cipriani. A dyslexic student”s perspective: which tablet features work best for dyslexics. 2015. The Yale Center for Dyslexia & Creativity. Stephen Hawking: a brief history of Mine-TV review. Dec. 9, 2013. The Guardian. Celebrating access today: 25th anniversary year of the Americans with Disabilities Act. Jan. 30, 2015. The United States Department of Justice.